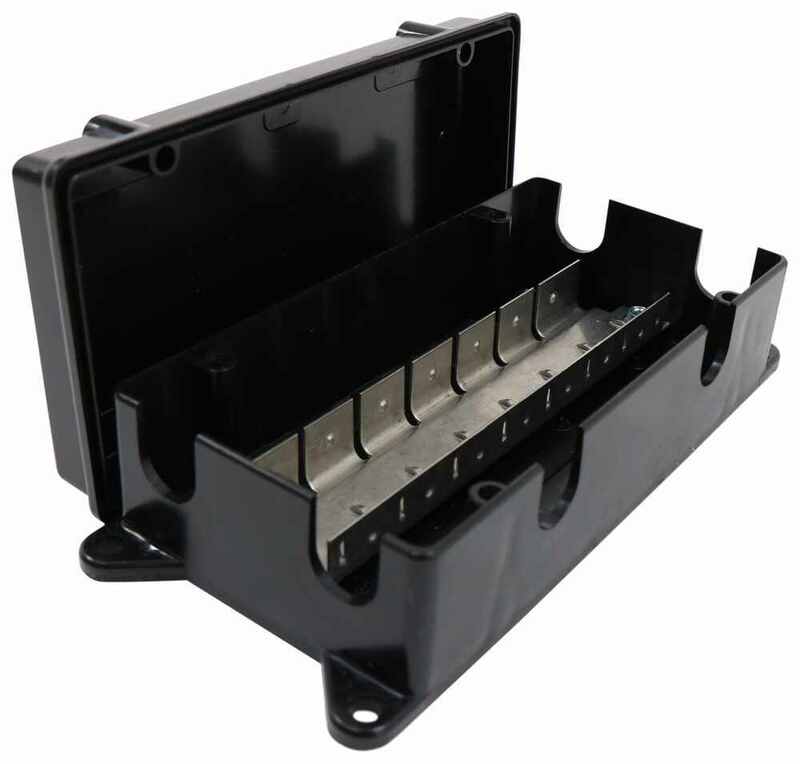 This circuit breaker junction box provides a neat, clean way to mount multiple circuit breakers to the firewall of your vehicle. Junction box has space for seven separate circuit breakers. 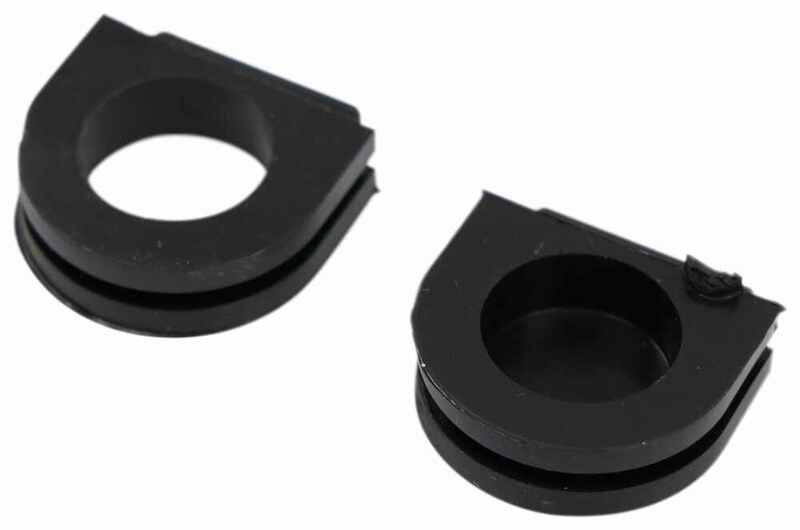 Call 800-298-8924 to order Pollak accessories and parts part number PK52249 or order online at etrailer.com. Free expert support on all Pollak products. 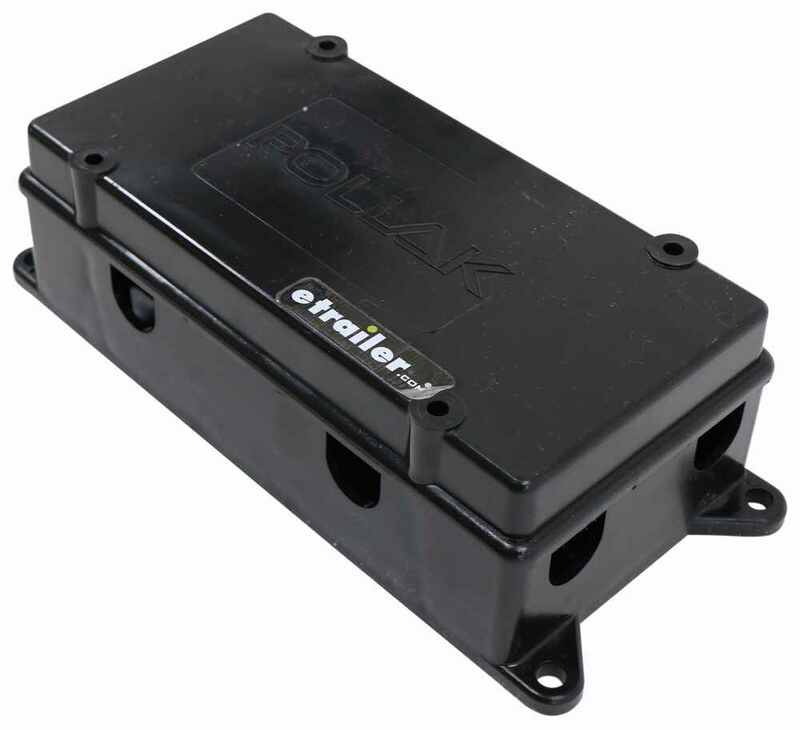 Guaranteed Lowest Price and Fastest Shipping for Pollak 7-Circuit-Breaker Junction Box. Accessories and Parts reviews from real customers. This circuit breaker junction box provides a neat, clean way to mount multiple circuit breakers to the firewall of your vehicle. Junction box has space for seven separate circuit breakers. 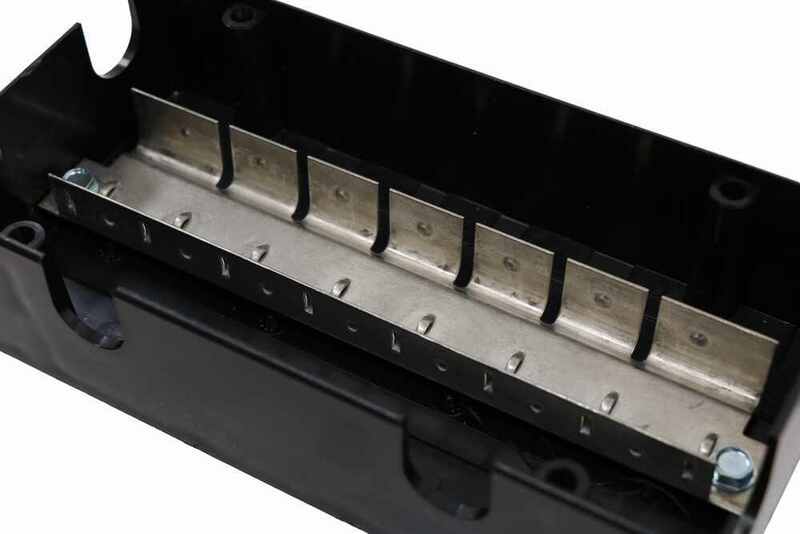 Breaker slots: .20" x .30"
Today we're going to review part number PK52249. This is the Pollak 7-circuit breaker junction box. Now this circuit breaker junction box will provide a nice, neat, clean way to mount multiple circuit breakers to the firewall of your vehicle. The junction box has space for 7 separate studded circuit breakers. Here's an example. I pulled one of the circuit breakers that is designed to fit in here. It will allow 7 of these to be installed in here. Does provide a nice, neat, clean mounting point for all of the circuit breakers. If you'll notice this metal bar right here is a bus bar and helps dissipate any heat buildup that might occur using the circuit breakers. Basically what you would do is on the circuit breakers they have a little indentation on each end. They're designed to line up with the protrusion on each side of here. What you want to make sure is when you put in a circuit breaker it says aux on one side and battery on the other. When you install these you want to make sure whatever wiring you have going in is all wired up correctly. Basically the way that you just push them in to the protrusion just like that and it will hold the circuit breaker in place. Then you run your wires in and do all your connections. Now it does include with this junction box the grommets, the holes. There's 2 holes on the side, 2 holes on each end. Whichever 2 you're not going to use, if you're going to run them in the ends and not on the sides, you can just take your solid grommet and just slide it right into place just like that. 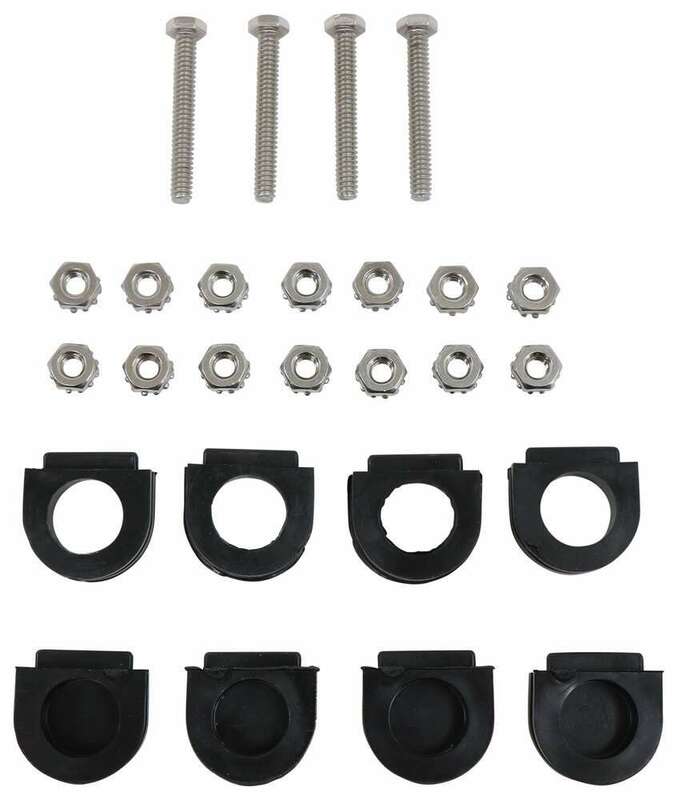 Then if you're going to use the ends it includes 4 large-hole grommets that you can just slide in like that on each end. The same way over here. Then that way when you go to put your lid on it pretty much protects any elements from getting inside there and affecting your circuit breakers. Does also come with 4 lid screws so once your lid's going to be attached just like that, put your screws in there, tighten those down. It will hold your lid into place. It also comes with 14 nuts. What those nuts are for is if you use 7 circuit breakers you'll have 2 nuts for attaching your wires to the circuit breaker. Then the circuit breaker would just pop off. It's held on in those protrusions on the indentations of the circuit breaker. Now I do want to give you a few measurements on this. Put the lid back on. Let's put it over the . There we go, just like that. The measurement I'm going to give you is the length. I'm not going to include the little mounting tabs, so the overall length is going to be 7-1/2" long. The width is going to be 3-3/4 wide. Then the height with the lid on is going to be right at 2-1/2". Then if you take the lid off the height without the lid is going to be right at 1-3/4". 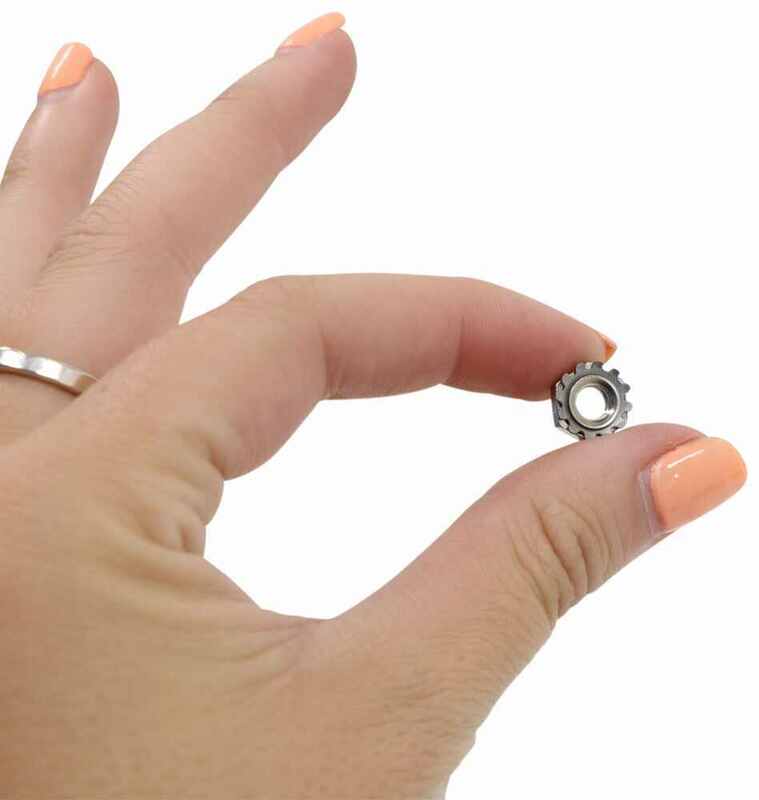 Then the measurement if you're needing the measurement of the bolt pattern mounting we'll measure center to center lengthwise and then center to center width-wise. If you put a ruler on it this way lengthwise is going to be right at 8-1/8" and center to center on the mounting holes is going to be right at 3-3/16 center to center for the mounting pattern that way. Going to just pop the grommets back off just like that. I'll put the lid back on and that should do it for the review on part number PK52249, the Pollak 7-circuit breaker junction box. .
Order: RelevanceNewestRating - High to LowRating - Low to High This circuit breaker junction box provides a neat, clean way to mount multiple circuit breakers to the firewall of your vehicle. Junction box has space for seven separate circuit breakers. When the three 50-amp circuit breakers in part # 90-22860 are installed with one of the compatible winches (all LP8500, LP10000, X3, and X3F models) they will provide protection for the winch's electrical system. The assembly includes two bus bars to link the breakers together. We do not have covers for the breakers but if you want to protect them from exposure you might use a junction box like the Pollak 7-Circuit-Breaker Junction Box # PK52249 which is shown in the linked video. On the Pollak 7-Circuit-Breaker Junction Box, # PK52249, the bar inside is just a mounting bracket for circuit breakers. You would connect power as needed to each circuit breaker. The bar was also designed to dissipate excess heat generated from the items attached to the circuit breakers in the box. 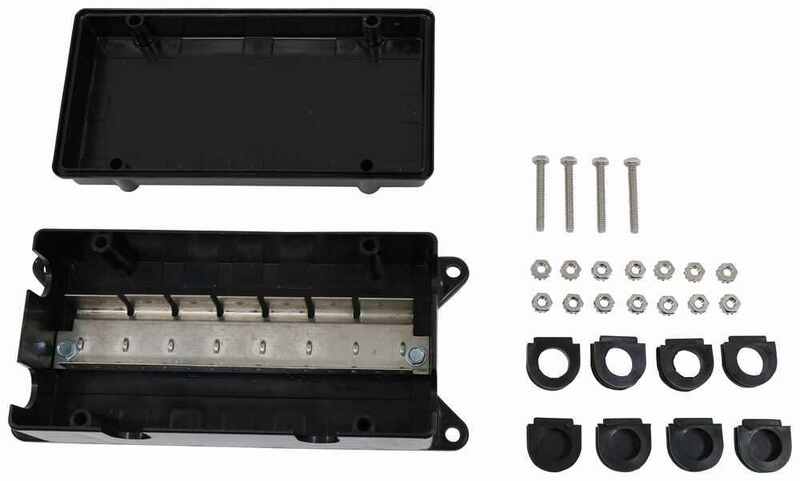 The box accepts studded circuit breakers like # PK54-120, # PK54-130, and # PK54-140. I strongly recommend protecting any circuit breakers, including the Pollak 30-Amp Auto Reset Circuit Breaker, # PK54230, from the elements. Corrosion and road grime can build up on the terminals and cause problems. 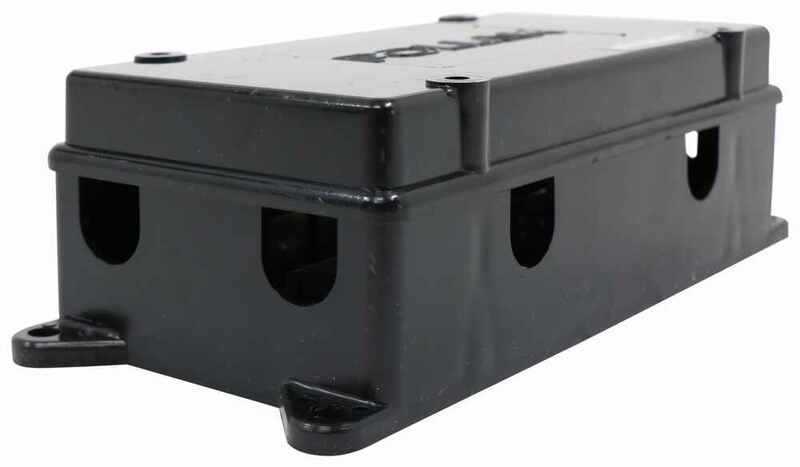 We typically use junction boxes, like part # PK52249, to protect electrical contacts on a trailer. These boxes have rubber grommets in the access holes for wires to keep water and dirt out. They can bolt to any surface strong enough to hold a plastic box. The circuit breaker I recommend is the 40-amp circuit breaker # 9510, it is .66 inches long and may fit inside a junction box easier. However, the place I would mount it is between the charger and the battery on the trailer side. The junction box I recommend is the Pollack # PK52249 as it provides neat, clean mounting point for multiple circuit breakers. The measurements are 7-1/2 inches long and 2-1/2 tall. See diagram to the right.